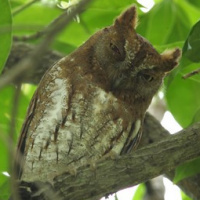 The Oriental Scops Owls is a very small owl with ear-tufts. 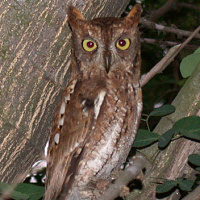 A grey-brown, reddish-grey and rufous morph are known to exist. Typical call - Dongzhai Nature Reserve, China. April 2011. CC George Wagner. Typical call - Tmat Boey, Cambodia. February 2005. CC Dave Farrow. Description: Rufous morph: The facial disc is pale rufous with a narrow dark rim. There is whitish around the blackish-grey bill. Eyes are yellow and eyebrows are white. 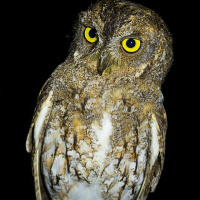 The hindneck has an indistinct rufous, black and white collar. Upperparts are rather plain rufous, with dark streaking on the forehead and crown. The scapulars have whitish-buff spots with blackish edges. Wings and tail are banded dark and pale. Underparts are somewhat paler than black, becoming buffish-white towards the belly. The feathers of the neck and breast have dark shaft-streaks with fine horizontal vermiculations, giving a faint 'herringbone' pattern. Tarsi are feathered to the base of the toes, which are greyish-brown with blackish-brown claws. 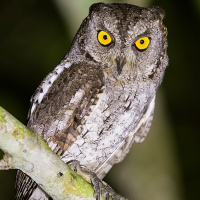 Other morphs: More spotted and streaked above, with the pattern of the underparts similar to the rufous morph, but with greyish-brown or reddish-grey ground colour. Size: Length 17-21cm. Wing length 119-158mm. Tail length 49-75mm. Weight 75-95g. Females are usually heavier than males. 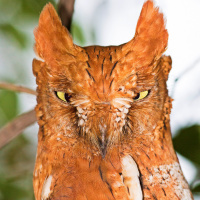 Habits: The Oriental Scops Owl is a nocturnal bird, with activity beginning at dusk. 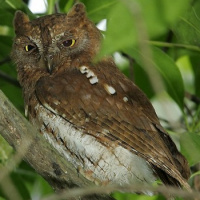 Roosts during the day singly, or sometimes in small groups, in dense foliage, against a tree trunk or in holes. Voice: A sequence of trisyllabic phrases of resonant, throaty notes - kroik ku kjooh. 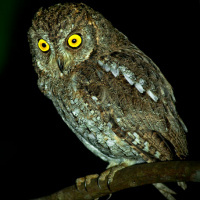 The regularity and rhythm of this call is quite variable over this owl's range. 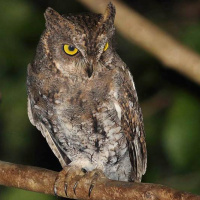 Hunting & Food: This owl feeds mainly on insects and spiders. They will also take small vertebrates. Hunting is done both from a perch and in flight. Breeding: Breeding season is from February to May in the Indian subcontinent. The male begins by singing near potential nesting sites, which are usually holes in trees or walls. This species will also use nesting boxes. It advertises by going in to the hole and singing at the entrance. Male and female will duet during courtship. 3-4 white eggs are laid on the floor of the nest. The female incubates these alone, while the male provides the food. Habitat: Open and semi-open woodland, parks, savannas with scattered trees and wooded riverside belts. This owl prefers to hunt near forest edges or in open country. Distribution: North Pakistan, India and Nepal east to Bangladesh and Assam, Sri Lanka, east Asia from Japan, east Siberia, Manchuria, Taiwan and east China to the Malay Peninsula; also resident on Andaman and Nicobar Islands. Vagrant to Hong Kong and the Aleutian Islands. Status: Generally common, scarce in some parts of its range. Original Description: Hodgson, Brian Houghton. 1836. Asiatic Researches, 19, p. 175-176. Page by Deane Lewis. Last updated 2016-06-10.